My seven-year-old son with autism used to get confused when it came to sequencing. That was 3 years ago; he now is a pro at it. Well, a second-degree red belt pro that is. Yes, Taekwondo has done wonders for his ability to learn sequencing. It also helps with focus, attention, respect, community, self-defense, and self-esteem. So if you’re not familiar with the practice of Taekwondo and why it helps kids on the spectrum with sequencing, let me explain how. When students of Taekwondo earn their belt colors/testing, they must master the Taekwondo forms/patterns called Taegeuk for that belt level. There are eight Taegeuk (forms) in the World Taekwondo Federation (WTF) that students learn and perform at testing for a color belt. This shows that the student can display their proficiency in individual techniques and the ability to perform techniques in a logical sequence. The Taegeuk patterns are all intended to simulate multiple attacks coming at the student from all sides. Each Taegeuk has 18 techniques/steps to master. The Taegeuk patterns become progressively more complex, and introduce more advanced techniques the higher you go. By the time the student reaches black belt, they will have learned 8 Taegeuk forms, and must demonstrate a mastery of each in sequence for their black belt test. This is the goal of my seven-year-old with autism. When my son began taking Taekwondo classes at age 5, I thought that perhaps this was an outlet for him to expend energy, learn to focus and pay attention to his master, and perhaps boost his self-esteem. Now keep in mind this studio is for neuro-typical kids and adults. My son is expected to behave, focus and attend just like all the other kids. The first few months were challenging and I thought that maybe we’ll be lucky if he gets to the next level after white belt (first belt), which is yellow belt. 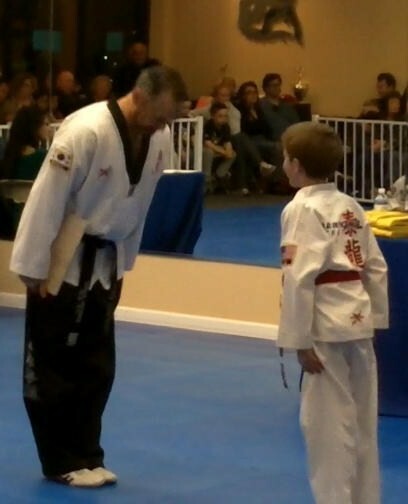 When I witnessed a yellow belt class practicing the first Taegeuk form and saw the 18 techniques taught in sequence, I thought that would put my son over the edge and would be the end of Taekwondo for him. Nope! Again, my son continues to amaze me with his perseverance, tenacity and just plain stubbornness. He not only learned all 18 techniques in the proper sequence, he overcame his fears and did his first board breaking. Granted, he covered his ears due to the loud snap of the board, but he was only using his leg/foot to break the board, not his hands. Yet. Fast forward to a few more belt testings later, and he must now do the previous three Taegeuk forms, plus the new fourth one. Yep, he learned them with ease. He has mastered sequencing. Now the board breaking technique for this belt test is knife hand strike, where he must break the board using one of his hands. I thought, how in the world is he going to get through this? He can’t cover both his ears AND break the board at the same time! Well, my son’s Taekwondo master is awesome. He worked with my son on this technique by using x-ray film sheets (that make loud sounds when hit) first. Slowly, he encouraged him in class to try the x-ray sheet with his knife hand strike while the other students were working out. So when it came to testing and he had to stand up in front of the entire class and their parents to do this technique without covering his ears, it was effortless. He did it! And miraculously, his fear of the loud sound the board breaking makes was vanquished. Every belt test after that, he looked forward to board breaks with excitement and performed them without anxiety. Talk about a self-esteem booster! We are 2 1/2 years into our son’s Taekwondo journey to black belt. Last week he tested for second degree red belt and passed his 7th Taegeuk form with flying colors. To date, he has learned seven forms with 18 techniques within each one! His board breaking technique was jump back spinning kick. Yes, a sequence again! And he mastered it so well, he broke the board on his first attempt. I can’t be more proud of his accomplishments in earning his Taekwondo belts. Next May (6 months) he will hopefully be ready for his black belt test. My son, the black belt. Oh, and he will have overcome his autism disability to obtain it. I’m already celebrating! 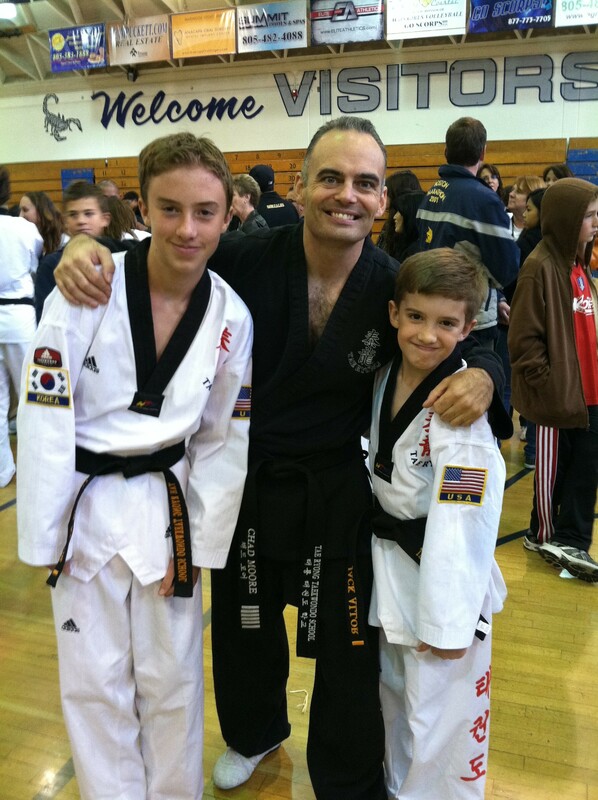 Update Nov. 2011 – my son the black belt! If you live in the Santa Clarita Valley, in Southern California, I highly recommend the Tae Ryong Taekwondo Studio taught by Sr. Master Chad Moore. He is a sixth degree DAN black belt and a wonderful instructor. He has classes for all levels/abilities for children and adults. His website is www.taeryong.net. If I were to take a poll of people and children (yes, I know, they are considered people too!) that have anxiety around costumed characters, it would be heavily weighted to more have issues than not. I never knew about this fear until I met my sister-in-law and at first I laughed about it. A grown adult afraid of costumed characters? I wasn’t being mean, just incredulous. I’ve always loved sitting on Santa’s lap, watching a clown perform or posing with Mickey Mouse for a photo. After all, we all know that there is a real person inside, right? Well, apparently rational thoughts vanish from the head when someone with a costume character phobia gets within 10 feet of a costumed character. For the sake of this article, let’s coin the term “costumephobia”. When my son with autism was 2 years old, I soon realized another person with costumephonia had entered my life. Little did I know that when we held him in our arms and posed with Goofy at Disneyland, he was having anxiety about it. When I sat him on Santa’s lap, he screamed and I couldn’t understand why. Clowns make him run frantically in the opposite direction and don’t even try to get him near that giant rat named Chuck E. Cheese! Now that I have a better understanding of his phobia, I steer clear of any costumed character we come across. When we are at Disneyland, we steer the stroller in the opposite direction of a character. One time we didn’t notice the costume character Sulley from Monster’s Inc up ahead. (I know, he’s in a 8′ neon blue costume and we missed it!) Well, my son saw him and jumped out of the stroller (yes, he unbuckled it and fled a moving vehicle!) and took off in the opposite direction. Today, our son with autism is old enough now to understand that a real person is inside the costume and that they won’t try to harm him. 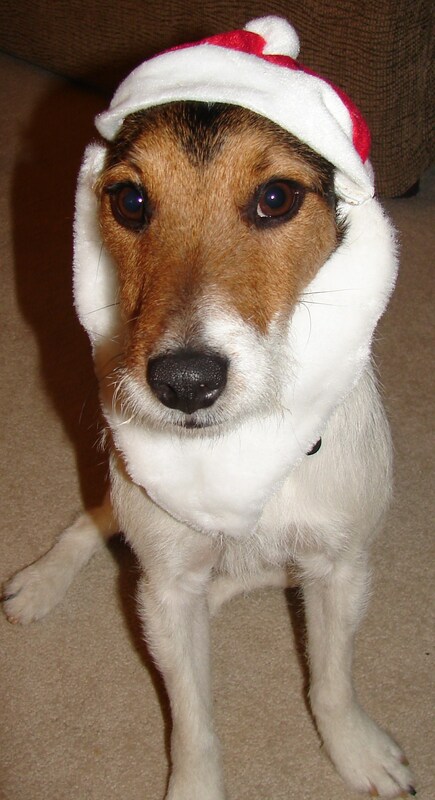 He can stand at a distance and observe them, but still will not willingly greet Santa. Last year at my husband’s office holiday party, Santa made an appearance and brought presents for the kids. When his name was called, my son ran up to him, grabbed his gift and ran back to safety. Apparently presents can entice him into a 5 second encounter and temporarily leave the costumephobia behind him! What are parents with kids on the spectrum to do about their child’s valid phobia this time of year when around every corner you turn is a Jolly Ol’ Man with a scary fake beard? Front loading your child before any outing or holiday party to let them know just what to expect will help those kids that are OK with seeing, but not getting close to a character. For kids that have extreme anxiety around a costume character, try showing them photos of the character, going to a store and touching a costume (or bring one home), talk about why they wear the costume and where you’ll be visiting that has characters there. A supplement that can help anxiety is the amino acid GABA. It is neuro-calming and helps with the neurotransmitters that are needed to balance the excitement or anxiety in our brains. Magnesium is also neuro-calming and can benefit those with anxiety. During this holiday season, it’s best to anticipate what may happen and prepare your child with autism or costumephobia on what to expect. Don’t make the mistake I did and force your child to sit on Santa’s lap. Enjoy this holiday season and relax around your costumephobic friends and family. They need you to be empathic and accept their phobia. Ho, ho, ho!